Air Force Special Operations Command combat controller Staff Sgt. Robert Gutierrez was awarded the Air Force Cross as announced by Chief of Staff of the Air Force Gen. Norton Schwartz Sept. 20, 2011. U.S. Air Force courtesy photo HURLBURT FIELD, Fla. (AFNS - 9/26/2011) -- As the only qualified joint terminal attack controller in an operation Oct. 5, 2009, an Air Force Special Operations Command combat controller knew the ground situation would be dire if he died. As an armor-piercing round entered his left shoulder and wreaked havoc throughout his chest, he said his focus wasn't on his young family in North Carolina. It was on his team. "I've seen those types of injuries before and time isn't your friend," said the Air Force Cross recipient Staff Sgt. Robert Gutierrez Jr. "I thought -- I have three minutes before I'm going to die. I've got to do something big. Based on that time frame, I'm going to change the world in three minutes." The team of 30 U.S. Army Special Forces and Afghan National Army commandos was surrounded in a "Taliban-sympathetic village" in the Herat province of Afghanistan. According to officials' reports, enemy fighters were positioned on rooftops just 10-feet from the team's position inside a neighboring building. Gutierrez was shot during the 4-hour firefight that included sniper and small-arms fire as well as rocket propelled grenades. 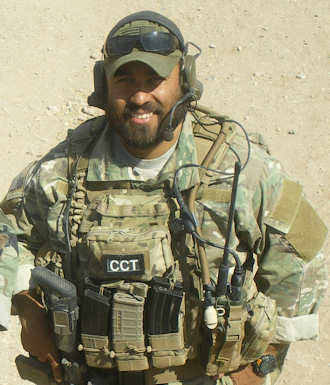 As the combat controller, Gutierrez was the only qualified radio operator communicating with Airmen overhead to provide close-air support and real-time battlefield surveillance that was critical for the team mission and to be able to evacuate their wounded. "Combat controllers are the air-to-ground interface, bringing the firepower and communications links to the ground force commander," Gutierrez said. "We bring an extraordinary amount of firepower in a small package (that is) able to shoot, move and communicate at the same time." Believing he was about to die, the San Diego native refused to remove his body armor, which held his radio, despite two medics repeatedly ordering him to take it off so his wounds could be treated. Gutierrez only relented momentarily, allowing the medic to insert a needle decompression tube just below his collar bone. A sucking chest wound, which is common in gunshot victims, fills the chest cavity with blood, collapsing the lungs. The medic's procedure released the growing pressure on his collapsed lung, allowing Gutierrez to breathe and speak -- so he got back on the radio. He continued to advise the ground force commander and request close air support of F-16 Fight Falcons and A-10 Thunderbolt IIs overhead. The A-10 pilot said Gutierrez's voice was calm the entire time, and he only knew of his injuries when the team was moving to the medical evacuation landing zone. "I realized he was shot after the third (and final) strafe pass," said Capt. Ethan Sabin, then assigned to the 354th Expeditionary Fighter Squadron. "He said he would be off of the 'mic' for a few to handle his gunshot wounds. Until that point he was calm, cool and collected." Gutierrez was awarded the Air Force Cross for extraordinary heroism, superb Airmanship and aggressiveness in the face of the enemy, according to the medal citation. Chief of Staff of the Air Force Gen. Norton Schwartz announced the award Sept. 20 during the Air Force Association convention in National Harbor, Md. "There is no doubt his heroic action under extremely dangerous circumstances and despite being wounded, saved the lives of his teammates," said Lt. Gen. Eric Fiel, the AFSOC commander. "His courage and character is unsurpassed. While I know he is a humble person that does not seek the spotlight, he is so deserving of the Air Force Cross. His actions are just a snapshot of what AFSOC Airmen are doing everyday in our current theater of operations." In all, Gutierrez incurreed a gunshot wound to the upper shoulder and triceps muscle, left chest and lateral muscle that resulted in two broken ribs, s broken scapula, softball-sized hole in his back, collapsed lung and multiple blood infections, which required three chest tubes, three blood transfusions and seven surgeries. To top it off, the "danger-close" 30 mm strafing runs ruptured both of his ear drums. Despite losing five pints of blood and walking 1.5 kilometers, Gutierrez stayed on the radio calling for his own medical evacuation and ensuring surveillance coverage for the safe return of the ground force team. Gutierrez credits the U.S. Army Special Forces medic and Air Force A-10 pilot with saving their lives. During an interview in early 2010, Gutierrez said, "I don't care if I get an award or not. The team was outstanding. I'm just a product of what I've been taught and a product of AFSOC." Since Sept. 11 there have been four Air Force Cross medals awarded, all to AFSOC Airmen. Gutierrez is the second living-recipient to receive the medal. Staff Sgt. Zachary Rhyner was awarded the Air Force Cross while assigned to the 21st Special Tactics Squadron, Pope Field, N.C., as a combat controller for combat operations April 6, 2008, in Nuristan province of Afghanistan. Gutierrez was also a teammate during that operation and received the Bronze Star Medal with Valor and Purple Heart. Gutierrez was assigned to the 21 STS during the 2009 operation and is currently assigned to the Air Force Special Operations Training Center here instructing future special tactics Airmen, so that they may be "First There...That Others May Live."